We first started hearing murmurs of a cozy new joint with small plates bearing the flavors of Taiwan about a year ago. Alas, before we got the chance to visit, they closed. It seems their popularity overran the original Bistro Bonbon’s size. Now relocated within Julu 758 in a slightly larger space, the restaurant is back serving up the greatest hits of the island’s cuisine. These recipes come straight from proprietor Jason Tsai’s mother. While Mama Tsai isn’t a professional chef, her methods (executed by local chefs) certainly make for a lovely meal. In his own charming way, Tsai guided us through the Chinese menu during our visit. He’ll even haul over his entire gin collection to your table if you express an interest. And speaking of which, starting out with a gin and tonic is a pretty good move, but you’ve also got to try some of Mama Tsai’s homemade plum wine (慪幥, meijiu, RMB98). The fragrant blend of sweet and sour enhances the meal’s hearty flavors. 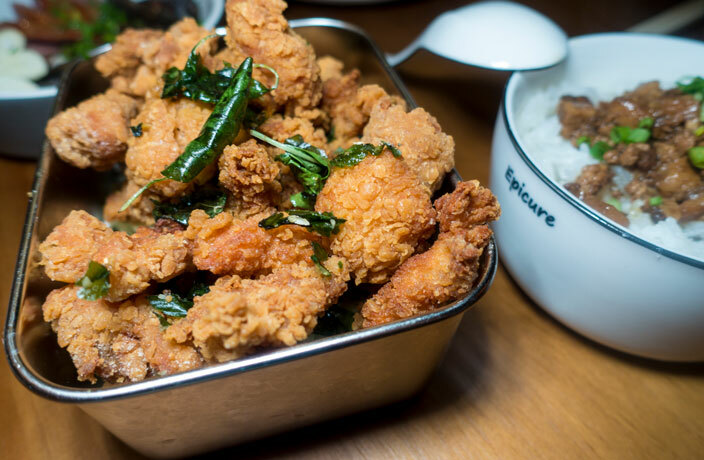 The menu consists of casual small plates like fried chicken with swooning basil leaves (阠晉崸, xiansuji, RMB38) and Taiwanese sausage (暕枅梿塇, Taiwan xiangchang, RMB68). Putting KFC to shame, fried morsels of crunchy popcorn chicken owe their moist interior to a soy sauce and five-spice marinade. Sliced links of house-made rice wine-sweetened pork sausage shine when combined with slivers of spicy raw garlic. Of the other pork options, we recommend the braised trotters (郆沑巊, luzhujiao, RMB58). This part of the animal is full of gelatin, which upon braising in the classic concoction of rice wine, soy sauce, sugar and star anise yields a soft, tender texture. It wins out over the less flavorful braised pork on rice (郆撱欹, luroufan, RMB30), a dish that begged for just a little more oomph. While not for fermented bean curd newbies, we dig their delicious deep-fried stinky tofu (墬姾嫲, choudoufu, RMB38). (敵帢斷執, shijin shucai, RMB38) and delicate steamed miso flower clams (柗歟岼嬻, weizheng huage, RMB68). The latter would’ve been better if the kitchen soaked the shellfish in water longer to get rid of the grit. The Clark Kent to their Superman is a lunchtime instant noodle place called Ramen Boy, which means you can order from a condensed selection of packaged treats at dinner. A bowl of their spiciest instant noodles (RMB48) served with fried egg and vegetables is a fun way of consuming more carbs. A dark and moody color scheme receives jolts of color from the ramen packets and paintings adorning the walls. With izakaya vibes and a nice selection of drinks, Bistro Bonbon is an ideal launch pad for an evening of bar hopping, or just a casual dinner with friends. Have you been to Bistro Bonbon? Post your review here for a chance to win a Saucepan voucher.